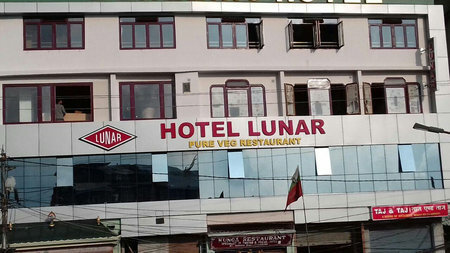 Lunar Hotel is located on Gandhi road and in the same building as the Dekeling Hotel. This small hotel having only six rooms falls in the category of 2 star but in the upper range. As in the case with most of the hotels in Darjeeling, such star category does not have a direct correlation with the star amenities that such hotels provide. Rather the room quality and location advantage mostly drive up the prices to such levels. Lunar too rides the same advantage. Having said that, Lunar does have six modern rooms that are quite nice and have standard amenities of a good hotel. You will need to climb up a narrow staircase from the left of the building to reach up to the reception, which is on the first floor. The large red board of Dekeling hotel overshadows that of the Lunar hotel and therefore its signs are not easily noticeable. 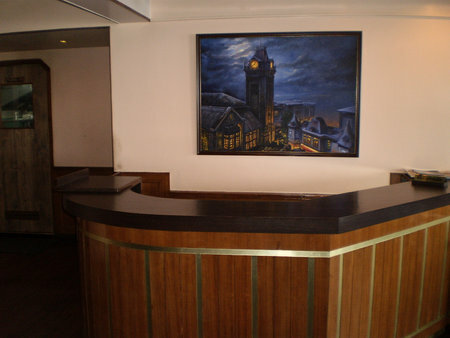 The reception counter is small but well done up with wooden finish and a large portrait on the wall. There are three double deluxe rooms at the reception level. There are three more in the upper floor. Out of those there is one which is Super Deluxe and little costlier. The other five rooms are almost identical. The rooms mostly have queen beds. The large windows open out to great views of the mountains. There are couple of cushioned chairs and a table laid out in front of the window for you to relax and enjoy the view. The rooms are modern, of standard size, well furnished and have wall LCD televisions with all the standard cable channels. 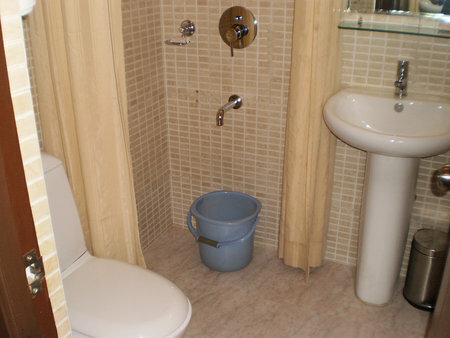 The bathrooms are of western style and have shower mixers with geyser. While the running hot water is available, you will need to keep in mind the power problem that Darjeeling has been facing since years. In case of power cuts, the geysers won't work. One of the highlights of the hotel is the Lunar Restaurant. This vegetarian restaurant is one of the most popular ones in its category and serves excellent North and South Indian vegetarian dishes, as well as Tandoor and Chinese items with lots of variations. The restaurant is located next to the reception counter. Lunar Hotel is owned by Mr. S.P. Chowdhury from Kolkata. Expectedly, the manager of the hotel Gautam Sarkar is also from Kolkata. During one of my chats with this young man, he mentioned that they completely rely on the word of mouth for developing goodwill and client base. And therefore they do not advertise or have a website of their own. In fact he mentioned that they noticed a website giving wrong and misleading information about the Lunar hotel and the restaurant, and therefore skeptical about such publicity. Over all, although small and the accommodations are limited, Lunar is an impressive hotel offering rooms with nice facilities and modern look. The rooms have views of the Himalayan range although there are some buildings in front. One of its great advantages is the central location on Gandhi road from where the Chowrasta Mall is less than five minutes. The rates are on a bit higher side and almost close to the 3 star rates, however during the off season you will get discounts. Lunar Hotel is located on Gandhi Road and right on the taxi stand and car park. This area is also known as Club Side. The Nehru Road is few steps away and leads to the Chowrasta Mall through glittering shops and stalls. The Clock Tower too is only yards away. There are several restaurants around the hotel including Dekevas and Kunga that are located below and can be accessed from the road. 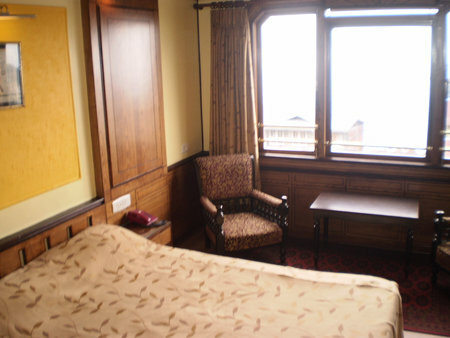 1) Check out Top Darjeeling 2 Star Hotels to know about the great mid priced hotels.